to guide you every step of the way. Companies today need a collaborative, knowledgeable and agile service provider to evolve their data center operations—from a complete transformation of their infrastructure to addressing a specific storage issue, as well as implementing virtual desktops or a hybrid cloud initiative. From infrastructure strategy and assessment to optimizations to staff augmentation, cStor helps clients create a more cost-effective data center architecture that scales and adapts to your business needs today, while preparing you for the requirements of tomorrow. cStor offers expert services to help you optimize your cloud infrastructure including management, maintenance, backup and planning. cStor offers comprehensive logistics and implementation services to make your new hardware and software installation worry-free. Leverage cStor’s experienced resources to help you solve your toughest business challenges and optimize your organization. cStor’s expert data migration services can help you smoothly migrate your data to help you reduce cost, risk and downtime. 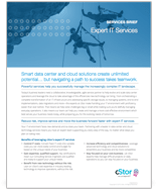 Let cStor expert resources optimize the day-to-day management of your IT infrastructure with a host of managed services options. Leverage cStor’s specialized IT skills for short-term, defined engagements to efficiently handle priority or unplanned projects. Need Expert Project Management Help? 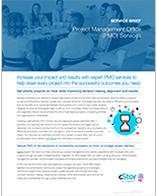 Get our PMO Service Brief.